Yesterday, my FLGS played host to what might be the largest Call of Cthulhu RPG convention ever held in Western New York. Three Game Masters (myself, Brandon and Dave) ran a total of five sessions of Call of Cthulhu over the course of nine hours, from noon to nine pm. Dave ran a pair of Classic Era (1920s) scenarios, one from noon to 4 and the second from 5 to 9. Brandon, running Call of Cthulhu for the first time ever, ran The Derelict, Chaosium's Free RPG Day offering from this year, a modern day scenario. I began the day with "The Dark Forest," a game set in second century Roman-occupied Germania, and ended it with something a bit special: an "Elimination Challenge" game, with a scenario designed to kill characters, with some pretty special prizes for the last to die. 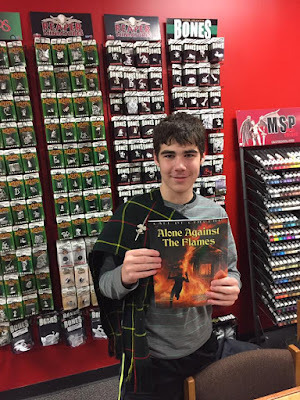 As far as prizes went, Chaosium sent us several copies of the "Quick-Start Guide" for 7th edition, and a couple copies of "Alone Against the Flames," a solo play adventure resembling a "Choose Your Own Adventure" book. Golden Goblin Press, a licensee for Call of Cthulhu, offered a $50 gift certificate for the Elimination Challenge as well as providing an adventure to run. 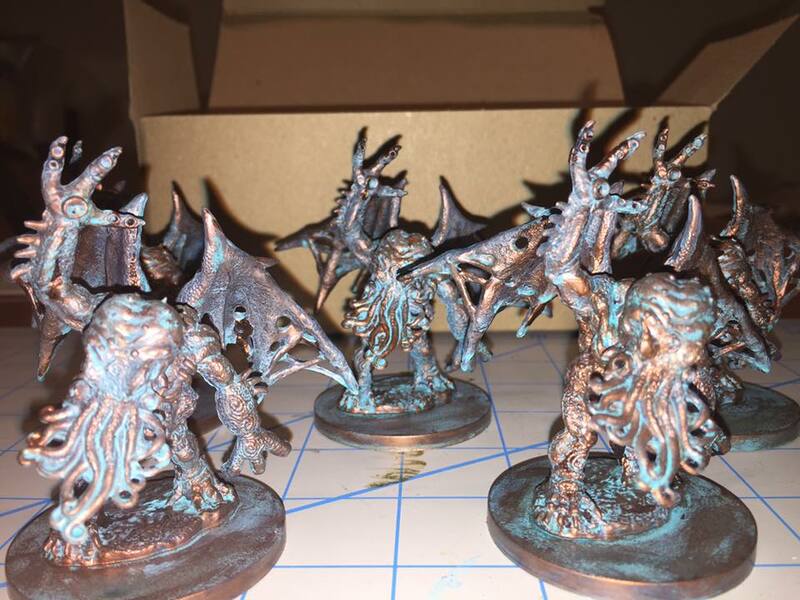 And finally, I purchased a bunch of Reaper Bones' "Eldritch Demons" and painted them up as patina'd bronze statues to provide trophies. "The Dark Forest" has the players taking the roles of a Roman long-range reconnaissance team, sent into the German forest to follow up on rumors of bandits preying on caravans and threatening open rebellion against Roman rule. 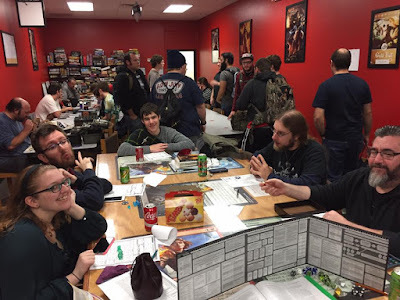 I had five players at the table, including my sister, her boyfriend, and Sandor, a Cthulhu veteran who made the drive from Albany to Rochester to participate, a good four-hour drive. 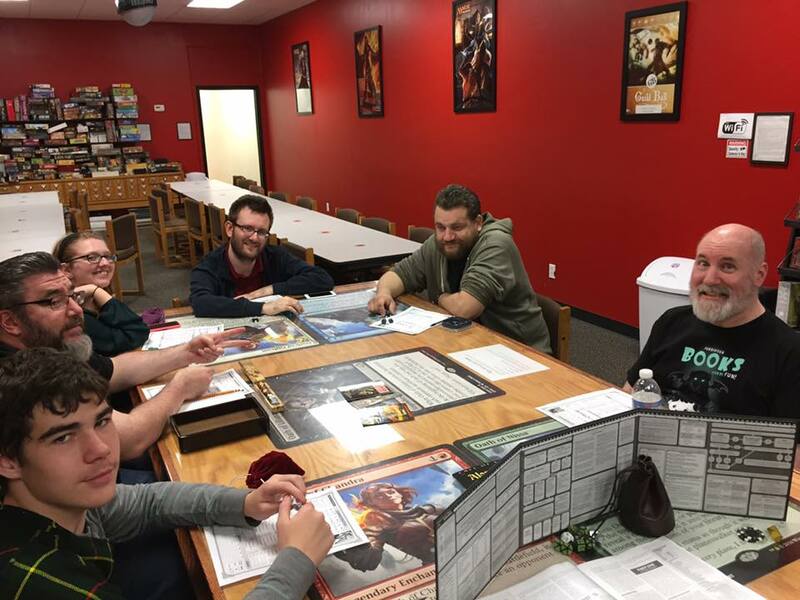 The scenario got a bit madcap once the players realized the "bandits" were in fact zombies, raised and commanded by a small group of cultists. Rather than run from the zombie horde and take refuge in a nearby abandoned hill fort upon discovery that a gladius is a poor choice of zombie-killing weapon, they invented a series of schemes involving fire and barricades before finally taking the hint and retreating from the horde. After circumventing the zombie horde and confronting the cultists, during which one investigator died to a massive, supernaturally-induced heart attack (there was a Magic: The Gathering event going on at the store at the same time, and the Magic players all stopped what they were doing to listen to my narration of this death. It was pretty cool), the rest of the investigators took one look at the summoned monster presiding over the ceremonies and decided that two German kids didn't need rescuing that badly, opting instead to retreat, make their report to the prefect, and let someone else deal with the cult. I decided to deal out the statue-trophies as a Player's Choice award, allowing the players to vote on who they think earned the trophy through good role-playing. The players decided that Sandor had earned the trophy, and I awarded a Keeper's Choice prize, a copy of the 7th Edition Quick-Start rules, to the person who got the second highest number of votes - who happened to be my sister. Honestly no playing of favorites there, she got the second most votes so I gave it to her. After a brief break, we came back and I set up for the Elimination Challenge. Six players sat down at this table, with Jen, Greg, Patrick and Sandor returning from my afternoon session, and joined by John and Chris. 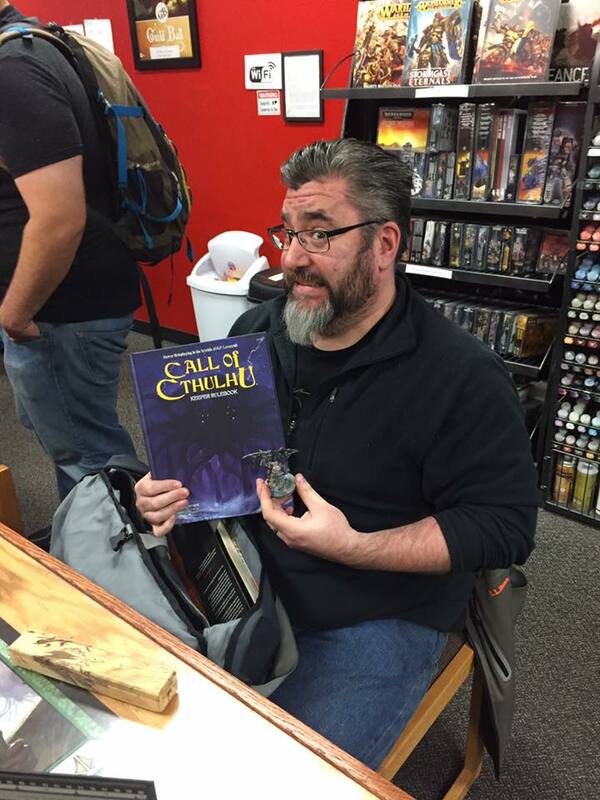 John had not played Call of Cthulhu in close to fifteen years, and his two sessions today were Patrick's first experience with Call of Cthulhu period. The premise of this scenario, "The Owlglass," is that the investigators are on a cargo ship traveling between New York City and Southampton. A fellow passenger, archaeologist Hutton, has brought a large crate on board, and becomes agitated when it's damaged in the hold. The crate contains "the Owlglass," a large, teardrop-shaped mineral deposit resembling an enormous fire opal, with a curious black spot that looks like the pupil of an eye. Unfortunately, the damage to the crate allows the Owlglass to "see" the night sky through the open cargo doors, and a meteor streaking across the sky gives its former owner the point of reference needed to track it down. There was a distinct air of "comedy of errors" in this session, most notably after Patrick's character had a run-in with a slug-like blob of animate, mutated human flesh; the slug-thing shot him in the calf with a dart, and fearing mutation, he proceeded to hack off his own leg below the knee with a butcher's knife. It was only through a miraculous series of good rolls that he survived at all; as is, he spent the remainder of the session at a single hit-point. Worst of all, when he managed to laboriously crawl to the infirmary (having hacked off his leg in the ship's galley) in search of painkillers, he discovered that the morphine was in a cabinet on the wall...about five feet off the ground. 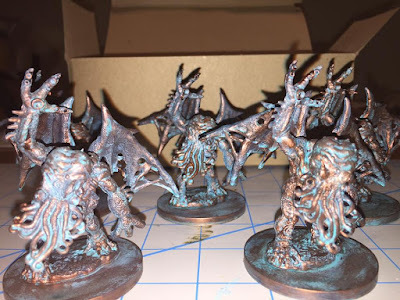 The rest of the party went to incredible lengths to try and find a way into the aft cargo hold (where the Owlglass and the inflatable dinghies they would need to escape were located) without having to deal with the Owlglass' mutant servitors, who had gathered around in chanting and praying. Ultimately, Jen, Chris and Sandor's characters met a variety of ends (including Chris, having hoisted the Owlglass up on a crane, riding the artifact into the briny depths like Slim Pickens riding the bomb after failing to secure himself while cutting the cable), and Greg, John and Patrick were feeling the mutation take hold. Patrick and John both succumbed to their mutations, transforming into servitors of the Owlglass (it having not been destroyed, only relocated). Seeing this, and recognizing that he would face the same fate, Greg's character opted to kill himself rather than become one of them. 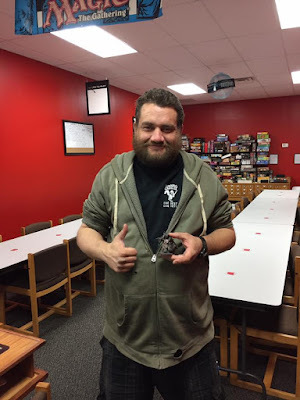 Since Greg was the last one to die (and I counted "mutated into a servitor of the Owlglass" as "dead" for the purposes of the Elimination Challenge), he walked away with the grand prize, a $50 gift certificate to the Golden Goblin Press webstore. Based on the speed at which they mutated, I determined that John was our second place winner, and Patrick came in third. John took home a Cthulhu statue/trophy, and Patrick a copy of "Alone Against the Flames," a solo-play scenario from Chaosium. Everyone had a phenomenal time, and we helped move some product on the store shelves; Brandon easily spent $200 on Cthulhu merchandise, buying a complete set of 7th edition materials as well as one of the Golden Goblin books, and Sandor purchased a 7th edition Keeper's Guide; I'm sure some of the other players bought Cthulhu material as well, plus other sales; one of the players in my afternoon game purchased a significant quantity of Savage Worlds material. I think this might become a regular Halloween thing. What a great idea! Makes me want to try something similar at my FLGS. Time to get planning for next Halloween!